Rocket City Tavern - Cooking With C.C. Back in the fall, I won a drawing for a $100 gift card for dinner for 2 at Rocket City Tavern. At that time, the restaurant had not yet opened. We wanted to wait until they had been open a while. A couple of Friday’s ago, we decided to go there for dinner and use the gift card. Rocket City Tavern is just outside of Gate 9 on Research Park Boulevard. You have to go south on Research Park Blvd over I565 and the restaurant is in a plaza on the right side of the road. You don’t have to have gate access to get to the restaurant. Rocket City Tavern is part of the restaurant group that includes Fiero Grill and Dipwich in the same building. Rocket City Tavern is the only one of the three open for dinner. The other two are open for lunch only. Hours are only Monday through Friday. We arrived around 5:30 and there were a number of other people in the restaurant, but it was not crowded. We were seated in a booth and started to review the menu. The menu is not overly large, but with plenty of options. I had trouble deciding on what to order. In addition, they have a small but varied wine list. It includes some very nice lower priced options as well as a few high end options. We settled on a glass of Cycles Pinot Noir from the California Central Coast. It was a very nice glass and went well with our food choices. We decided to start with appetizers. Lori ordered the Rocket City Frito Pie and I ordered the Black Pepper Caramel Chicken Wings. The Frito pie was an interesting combination of sausage bolognese sauce with a cheese sauce and pico di gallo. It actually went together well. Lori really liked it, I thought it was OK, but I’m not a fan of Fritos. My chicken wings had a nice coating that was sweet and not too hot. As you know by now, I don’t really like a lot of heat, so this was plenty for me. The caramel was a nice contrast with the chicken. For our entrees, we had a hard time deciding what to order. 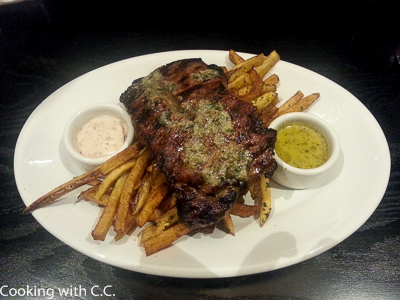 Lori ended up ordering the Tuscan Seared Salmon and I had the Steak Frites with the New York Strip. The salmon had a very nice flavor with the herbs and the potatoes and vegetables. The steak was cooked the way I wanted and was served with a flavored butter and an olive aioli. It was served on a bed of herbed fries. The flavors all complemented each other extremely well. We really enjoyed everything. Now we had the next really difficult decision – what to get for dessert. Lori decided she wanted to White Chocolate Bread Pudding, so that’s what we ordered. (I was looking at the Warm Chocolate Chunk Cookie Sundae). The bread pudding includes a raspberry and white chocolate sauce with raspberries and whipped cream. Since Lori is allergic to raspberries, they switched everything to strawberries for her. The bread pudding had a very nice consistency and Lori really liked the combination. About this time, our waiter came back and told us we hadn’t hit our $100 yet, so did I want to go ahead and get the cookie sundae as well? What is one to say? Of course, bring it on! The sundae was a nice large chocolate chip cookie with vanilla ice cream and hot fudge sauce on top. How can you go wrong with that? The hot fudge sauce was really the star here (not that the cookie and ice cream were bad….). This dessert was really nice. So, after two glasses of wine, two appetizers, two entrees and two desserts, we still hadn’t gotten to the $100 point. The Rocket City Tavern is very affordable will all but one entree (the NY Strip) under $20. We enjoyed everything and will certainly go back. If you normally don’t head out towards the arsenal by Gate 9 (Research Park Boulevard), make the trip. It’s close to Bridge Street and certainly less crowded. Here are the details: Rocket City Tavern, 2100 Rideout Road SW, Open Mon-Thurs 10:30AM to 9:00PM and Friday 10:30AM to 10:00PM. Saturday’s are available for private events.